Since independence from Portugal in 1974, Guinea-Bissau has experienced considerable political and military upheaval. In 1980, a military coup established authoritarian dictator Joao Bernardo 'Nino' VIEIRA as president. Despite setting a path to a market economy and multiparty system, VIEIRA's regime was characterized by the suppression of political opposition and the purging of political rivals. Several coup attempts through the 1980s and early 1990s failed to unseat him. In 1994 VIEIRA was elected president in the country's first free elections. A military mutiny and resulting civil war in 1998 eventually led to VIEIRA's ouster in May 1999. In February 2000, a transitional government turned over power to opposition leader Kumba YALA, after he was elected president in transparent polling. In September 2003, after only three years in office, YALA was ousted by the military in a bloodless coup, and businessman Henrique ROSA was sworn in as interim president. In 2005, former President VIEIRA was re-elected president pledging to pursue economic development and national reconciliation. He was assassinated in March 2009; new elections are to take place in June 2009. For silver and base metal coins of Guinea Bissau, please look at our original Chard Coins website. 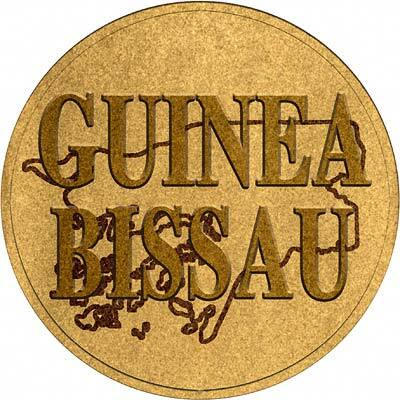 We make an active market in almost all world coins, gold or otherwise, including Guinea Bissau gold coins. If you have any of these coins to sell, please contact us, or post them to us for appraisal and offer.